Water Softener Market size is set to surpass USD 10 billion by 2024; according to a new research report by Global Market Insights, Inc. Intensifying demand for soft water owing to growing industrialization and urbanization may expand water softener market growth by 2024. Growing penetration of multinational brands along with its features including high effectiveness in decreasing formation of scale in boilers, pipes and tanks are likely to further propel product demand. This equipment improves product lifespan of water using appliances by removing salts and minerals, which can damage product quality. Growing customer spending on water treatment equipment supported by increasing contamination issues will propel product demand. Supporting government regulation in Europe and Asia pacific reinforced by R&D activities on water softener manufacturing will promote product demand. Additionally, rising industrial sector and manufacturing industries may fuel water softener demand owing to application of soft water in steam generation, product manufacturing and cleaning. Global salt free water softener market is anticipated to exceed USD 2 billion in projected timeline owing to its extensive consumption in the U.S. There is no electrical valve required in salt-free softener as system operates as a conditioner and do not captures anything, thus eliminating need to purge minerals. Soft water from this system results in less soap consumption and brighter laundry, which is anticipated to stimulate product demand. New product innovation and rising demand for safe water in residential buildings is projected to drive regional market over forecast timeframe. Increasing monetary standards along with growing awareness about damaging properties of hard water are likely to boost the market growth. 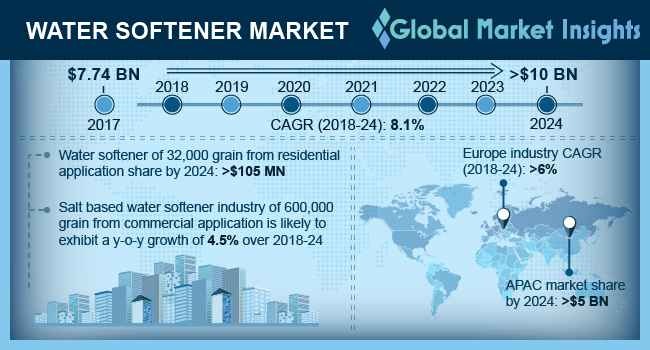 Global water softener market size of 120,000 grain from office building application is poised to observe gains of over by 4% 2024. Increase in consumer health consciousness has led to rise in demand for healthy and safe drinking water which is likely spur product demand. Water softener in home decreases greenhouse gases, reduce chlorine content and removes odor with good efficiency is likely to augment product demand. Water appliances use less energy and last longer by using softener reduces carbon footprint and preserving resources for a longer span of time, thereby driving market size. This equipment is partially banned in 34 states worldwide due its contamination in ground water, manufacturer needs to take legal help from national Water Quality Association to litigate against local laws, which is likely to hamper industry profitability and addon additional compliance cost, thereby affecting water softener market price trends. UK salt-based water softener market size in 900,000 grain from hotel/restaurants is likely to surpass USD 3 million due to its usage in removing lime scale on toilets, tile and faucets. It eliminates scale causing minerals in water, subsequently resulting in cleaner fittings and tiles, which may propel product demand. China water softener demand in 1200,000 grain from laundries units is projected to witness gains of up to 7%. Fabric quality is adversely affected along with high amount of detergent is required when hard water is used thus, softener is needed for both cleaning and washing applications. Softening equipment is used in this industry to maintain quality, easy cleaning of fabrics and also reduces the amount of detergent required, which may boost market growth. Global water softener market share is competitive and moderately consolidated with key industry precipitants includes, Culligan International Company, General Electric Company, Pentair, Whirlpool, Honeywell International and 3M. Increasing consumption of soft water has encouraged sellers to invest intensely in R&D for the product. Companies are spending more on product design, increasing efficiency and reducing environmental impacts.